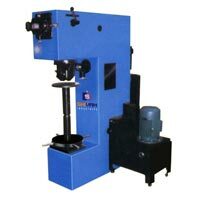 We are into manufacturing as well as supplying of Brinell Hardness Testing Machine in India. 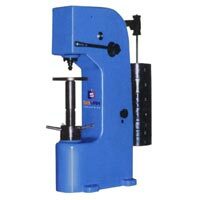 Our Brinell Hardness Testing Machine is available in different models namely SHI â�� B 3000 â�� J, SHI â�� B 3000 â�� H and SHI â�� B 3000 â�� O. Brinell Hardness Testing Machine is quite appraised for ease of operation and low maintenance. Machine designed with a hydraulic power pack and control for effortless loading operation. A dial gauge in front measures depth of ball penetration. 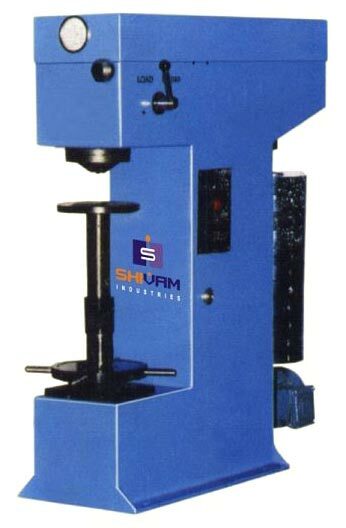 This facilitates production testing within tolerance limits by compression method. 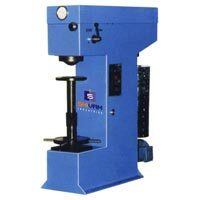 Simplest model of Brinell Hardness tester with mechanical design. Loading, unloading manual, best suitable for testing batch quantity. Basic Machine design and operations are similar to â��Hâ�� Model. In addition, an â��Optical Deviceâ�� with 14x magnification provided front to project dia of ball impression on glass screen with a micrometer measuring system with 0.01 mm accuracy. The indenter swivel and projects dia of ball impression immediately after unloading operation which avoids additional time for measurement of ball impression. This give real Brinell number on production testing.